Bongeunsa is a 1200 year old Buddhist temple in Seoul, South Korea. This morning I headed up to San Francisco to take some photographs of the Golden Gate bridge. As you can see from these iPhone snapshots, I was using my Mamiya 645 1000s which I had loaded with Kodak Ektar 100. The first place I visited was the Marin Headlands for the classic tourist shot with San Francisco in the background. I then tried to head higher up into the Headlands but the road was closed for construction. I did take a few photos at the visitor center before heading back over the bridge to Fort Point. If you have never been to Fort Point, it is highly recommended. It is great for taking the bridge from a viewpoint that's a little different from most tourist shots. The fort itself is also quite interesting inside with exhibitions on the history of the fort and life back when it was in use. And you can climb up to the roof where you can stand right under the bridge. Growing up in Dublin, Ireland, I first heard the term "Joshua Tree" in 1987 when local rock band U2 released their classic album of the same name. Completely enthralled by the music, I was also captivated by the moody black and white photographs on the album cover which depicted the band in a landscape very different from the one I had grown up in. Some twenty years later, I finally had the opportunity to visit the park with my wife on a road trip during the winter of 2007. Located about 140 miles east of Los Angeles, California, Joshua Tree National Park straddles two deserts, each with it's own distinct ecosystem. The hotter Colorado desert sits to the east of the park, and to the west and higher in elevation is the cooler Mojave desert. With U2's "Where the Streets Have No Name" playing on the car stereo, we entered the park from the town of Twentynine Palms and it wasn't long before we saw the trees after which the park is named. I had my trusty Harrow camera with me to document what I saw. Stopping off at various rock formations and monoliths, we got a sense of the ruggedness of the terrain and the beauty of the desert landscape. Above us, rock climbers inched their way up world class climbing routes or worked out on the many bouldering problems scattered about the park making me wish I had packed my climbing shoes and crash pad. From the overlook at Keys View, the views of the Coachella Valley were partially obscured by smog that rolls into the valley from Los Angeles and the surrounding cities, but we could make out the San Andreas fault and, in the distance to the south, the Salton Sea. If you are ever in the Southern California area, Joshua Tree National Park is definitely worth a stop. Update: I have just noticed that the images in this post are missing. Please bare with me as I restore them. Spend the last few days camping in Lake Tahoe and I took my Polaroid Automatic 230 with me. Here are a few photos from the camping trip. 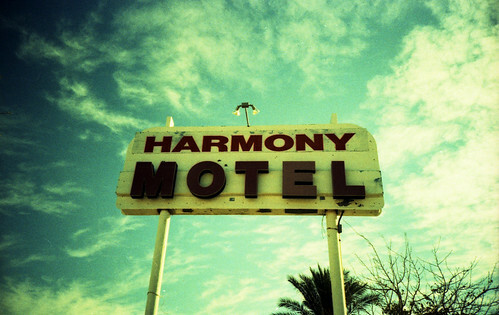 Harmony Motel, originally uploaded by Dave Dunne. Last weekend I finished up a 24 exposure roll of Fuji Sensia 400 in my LOMO LC-A but I couldn't remember what was at the beginning of the roll. It was a nice surprise to find some photos from a road trip I took to Joshua Tree National Park last winter. This photo is from the town of Twentynine Palms just outside the park. 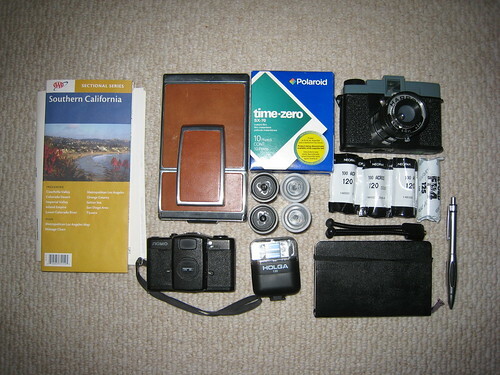 Gear for a road trip around Joshua Tree and the Palm Springs area. AAA map, Polaroid SX-70 and Time-Zero film. Harrow (Diana clone) camera with Fuji Acros and Ilford FP4 120 film. Lomo LC-A, Revue and Agfa Precisa film, and a Holga Starblitz flash. A small bendable tripod, a notebook and pencil.